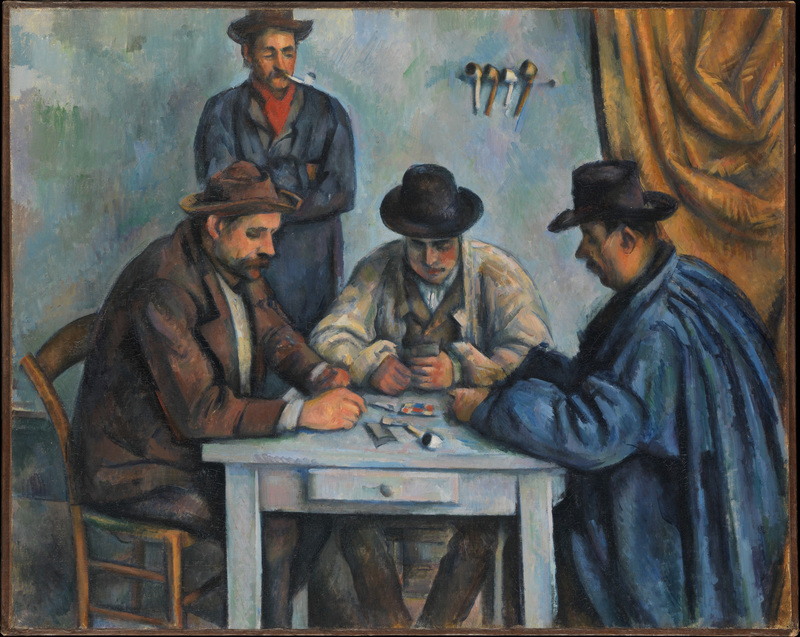 Two beautiful, complex oil paintings resulted from a number of studies Cézanne did in watercolor, pencil, and even oil, of the individual players he would assemble in Les Joueurs de cartes (R706 and R707-FWN680). Of the two, the four-player version is the smaller, but it is more direct—less grandiloquent—and more simply realized. Both are masterpieces, but of a different kind. 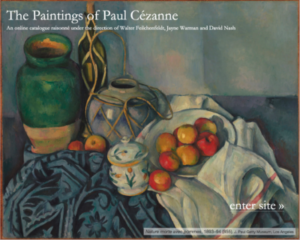 This one is asymmetrical, oblique, with no object clearly in the center except perhaps for legs of the central figure, which are barely visible, and his hands, which are saturated in color and dense, and highly visible. 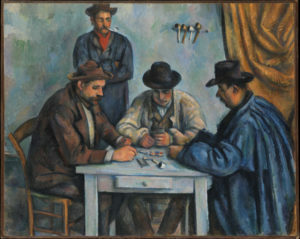 Yet the heavy drapery and the massive back of the man in the blue smock balance the figures on the left, and everything points to the cards: everyone’s gaze, several of the arms, and even the pipe rack on the wall. We always know, as it were, what part of the picture to come back to, and we come back to it inevitably, thanks to these concentrated forms. The figures inhabit their space easily, leaving each other ample room. (In the other picture, twice as large as this one, the composition is more symmetrical, the space is more dense, and more complex diagonal lines connect the figures.) The left side establishes the direction of the light by placement of the standing figure’s shadow, and we can see the same light illuminating the heads. The immediate impression of rightness and balance that we form is the effect of all these carefully thought through relationships. The painting is finely realized in its details as well. 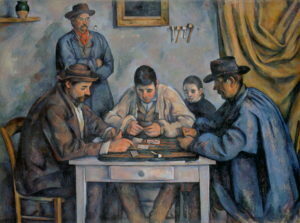 The light-colored table, for example, seen in the flesh, is a carefully laid down surface of blues, reds, ochres, browns, and greens—the very colors of the cards on the table and of the painting as a whole; as he has done before, Cézanne has used a neutral surface to recapitulate the entire color scheme, and he does so in the wall as well (and adds green to balance the intense reds).